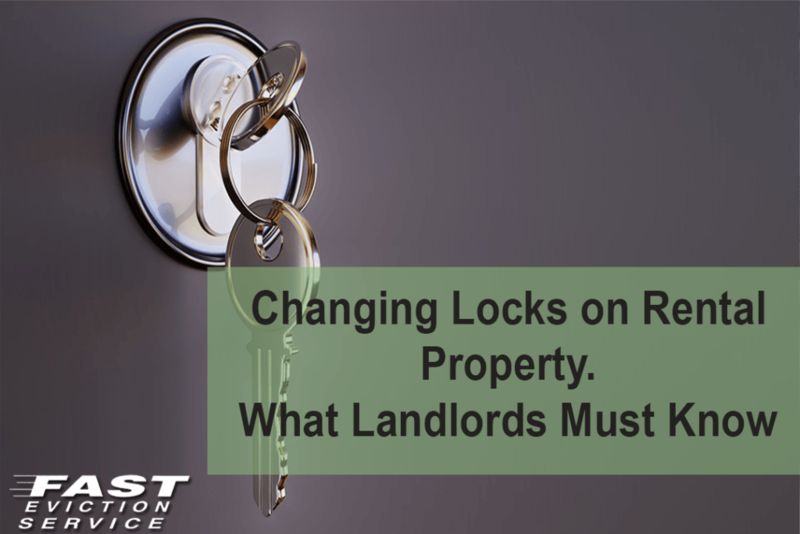 Changing locks on rental property becomes a big issue for both landlords and tenants as if they aren’t aware of the rules regarding lock changing. Whether it is the tenant changing the locks or the landlord, there are a few things that are essential to understand beforehand. There can be a situation where the tenant has paid the rent until the 30th of current month but chooses to move out on the 10th. . Upon visiting the property, you find out that tenant has taken the belongings but has changed the locks and hasn’t returned you the keys. In this case, you cannot enter the property or show it to other prospective renters. So, what are you going to do? What does the law says about such a scenario? What if your lease or rental agreement does not address this kind of situation of changing locks on rental property? Well, you have the right to change the locks in this case but you must inform your tenant that you will be changing the locks on the 1st of the next month. If you cannot wait that long, inform the tenant that as the landlord you are changing the locks on the rental property and he/she can pick up the spare key if required. Whether the tenant responds or not, you can go ahead with lock changing on the date mentioned in the notice. Remember, a landlord cannot change the locks without notifying the tenant because the rent is already paid and the tenant has every right to access the property until the end of month. Also, since the tenant has changed the locks and caused you unnecessary trouble by not handing over the keys, therefore, you can change the locks and deduct the expenses from the tenant’s security deposit. However, the law varies in every state so do check the law regarding conditions of security deposit deduction in your state. If the tenant has violated any of the terms of the lease or rental agreement such as causing damages to the property or has stopped paying you the rent, then you need to consider the legal eviction procedure so as to prevent the tenant from entering. You simply cannot change the locks and put the tenant’s belongings outside the property as it is illegal in every state and the tenant can sue you for that and will probably win the case. Therefore, the only solution as a landlord to prevent trouble is to follow the state’s eviction procedure as defined in the law. It will be much faster, safer and cheaper than you might believe. Include a clause in your lease or rental agreement regarding lock changing to prevent all sorts of confusions and problems later on. Alternately, you can create a lock policy and get it signed by the tenant before moving in. Include terms and situations when you can stop the tenant from changing the locks or requesting for extra keys. If the lease or rental agreement doesn’t include terms about changing the lock on the rental property, then tenants can change them at their will. According to the law in States like California, landlords have the right to have a key to access the rental property and tenants cannot prohibit them from entering. However, we suggest that you include instructions about landlord inspection and the type of occasions when you can visit the property. In California, you must give your tenant 24 hour notice that you will be entering the rental property, except in an emergency such as a fire or a gas leak. Clearly outline emergency scenarios that allow you to enter the property without prior notice and how to go about repairs and maintenance related issues. If you are going to allow your tenants to change locks, state it in the lease or rental agreement as well and don’t forget to mention that tenants are bound to give you a set of keys after changing locks otherwise it will be deemed violation of the lease terms. Please be careful while giving this right to your tenants because it is possible that they may never return to you all the keys and keep one with them after moving out. Landlords can never realize if there is still a set of keys left with the tenants, which can cause all sorts of potential troubles later on. That’s why, as a landlord it is always a good idea to change the locks on rental property when you change tenants and give one set of keys to the tenants.